Noted as James Bond’s favorite fragrance in “Diamonds Are Forever”, Eucris has quite a pedigree. Created by the distinguished barber and perfumer Geo F Trumper, established in London in 1875, Eucris is one of the house’s classics, a warm, mossy aroma composed of blackcurrant, cumin and coriander, a heart of jasmine and muguet and base notes of sandalwood, musk and moss. Eucris opens with a slightly tart currant note paired with lemony coriander. I don’t detect the cumin at all, thank goodness, but I find the inclusion of these two notes, often used together in curry dishes, to be quite remarkable. The top notes immediately give way to the floral notes, never really dominant, but rather a soft, white bed for the top and base notes to rest upon. Finally, the base lends an earthy, almost vetiver-like hint of moss, musk and woods, and I suspect the sandalwood used is Mysore due to the bitterness. When put together, the composition is surprising. The overall effect is understated, slightly dark, slightly tangy, and totally incomparable. The packaging for Eucris is as striking as the aroma. Housed in a vintage-style black glass bottle with a black and white label from the turn of the century and a small pewter crown as stopper, this one is gonna look great on a vanity or dresser. The vintage appeal and mossy woody undertones would make this one ideal for pleasing either our inner Goths or inner Gary Coopers. Wearable by a woman, though perhaps better suited for a man due to the composition’s classical tailoring, this is one that must be tried. Heck, if the composition doesn’t grab you, the bottle surely will! 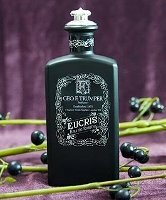 Geo F Trumper Eucris is an Eau de Toilette and is sold in a 100 ml bottle. For buying information, see the listing for Geo F Trumper under Perfume Houses. Marlen I was pleasantly surprised to find your review of Eucris. Reading your reviews I come to two conclusions: one: you really do have an insatiable curiosity for fragrances & two: even if a fragrance has a single molecule of musk, you WILL find it! The aromatic herbal note in Eucris has always reminded me of Yatagan. I like them both! What's your take on this? Thanks, buddy! I'm also a huge fan of Caron fragrances, and just received my first botle of Yatagan…I'm saving it for fall along with my JHL. I haven't worn either enough to be able to compare Eucris and Yatagan, but find the latter to be heavier, more animalic and woodier, while the former is more mossy and “tailored”. Whatcha think? I read somewhere that Eucris was one of Tom Ford's favorites (so is Yatagan btw). C5 – maybe Aztec's on to something? Marlen, this sounds so intriguing! I tend to be drawn to men's fragrances every once in a while…I'm going to search for a sample. Thanks for a brilliant review! Marlen, What is Yatagan (btw)? Absolutely gorgeous bottle! I now want to buy this for my husband! It will look fantastic on his bureau! Marlen, thanks for the excellent review! I just bought Yatagan for my husband; now I'll have to search out this as well. It sounds wonderful – I love mossy and understated on him. We shall see…..
Yatagan is a fragrance by Caron that is absolutely a product of its time – late 70's. It's a darker herbal/animalic and is fantastic! I'll make sure to do a review of it for next month! Yatagan and Eucris – both in my rotation as key scents. Eucris is the scent of a perfectly well scrubbed gent. Yatagan is just the right side of insanely dirty. Toss up then between Habit Rouge EdP or Knize Ten, an old bottle of Egoïste or French Lover from Malle.